Scary Terry's World: Yogi Bear and Boo-BOO! Batman wasn't the only pop culture craze of the '60s to worm its way into the comics -- monsters were a big deal for the boomer generation. 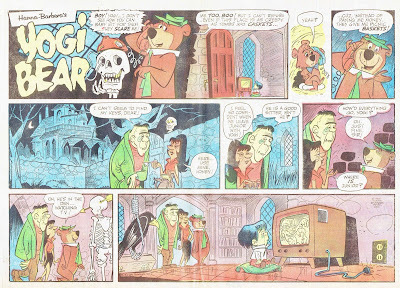 With The Addams Family and The Munsters making a big splash on television, why not give Yogi Bear some funny monster neighbors? Again -- some really good cartooning. And dig that scary logo lettering! So who drew this? At least one of you toon-heads knows, so give with the info, will ya?